With the addition of gentle lighting (the Sputniks have been banished to the outer edges of the galaxy thankfully) and some colonial era prints and knick-knacks, what was a bleak and barren space has been transformed into a warm, elegant and comfortable interior. 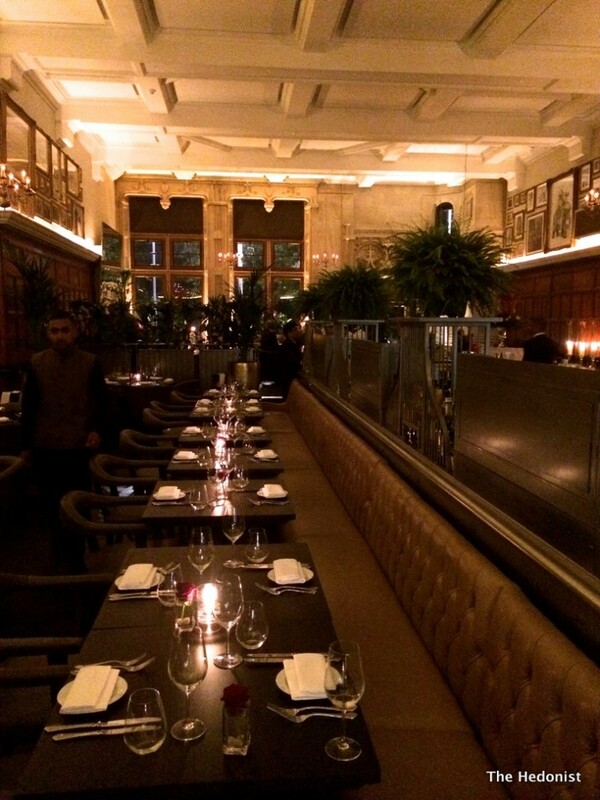 It combines the clubby colonial feel of Gymkhana with the intimate grandeur of the Berners Tavern so Zaika is very on trend. So to the food and drink. 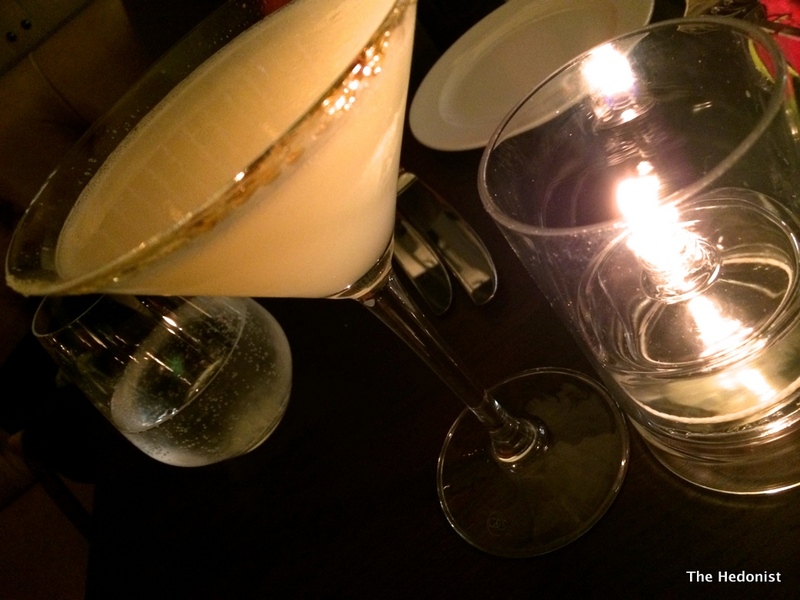 For some reason cocktails in Indian restaurants are often mixed with too much sugar for me and the Zaika Margarita (£8.50) had a ‘lime caramelised sugar’ rather than a salt rim. 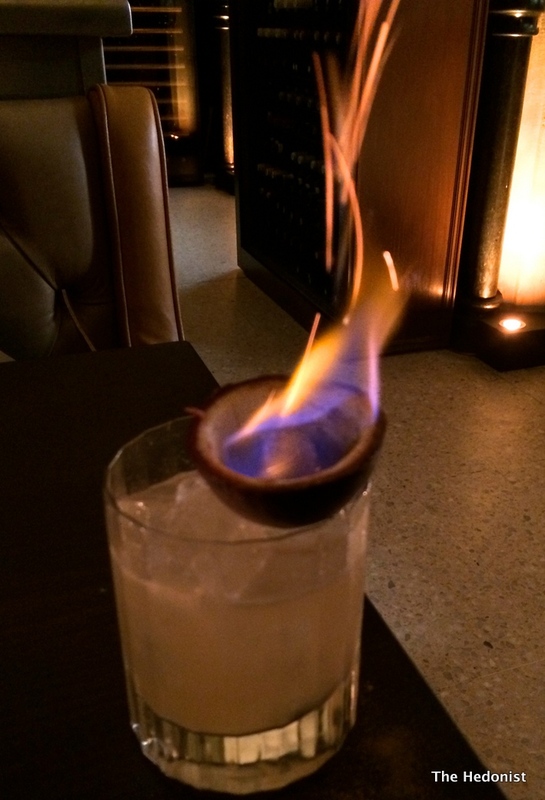 The Bonfire, which blended Bombay Sapphire Gin with lychee juice and spirit and chillies(£8.50), was great to look at but didn’t set my taste buds on fire. 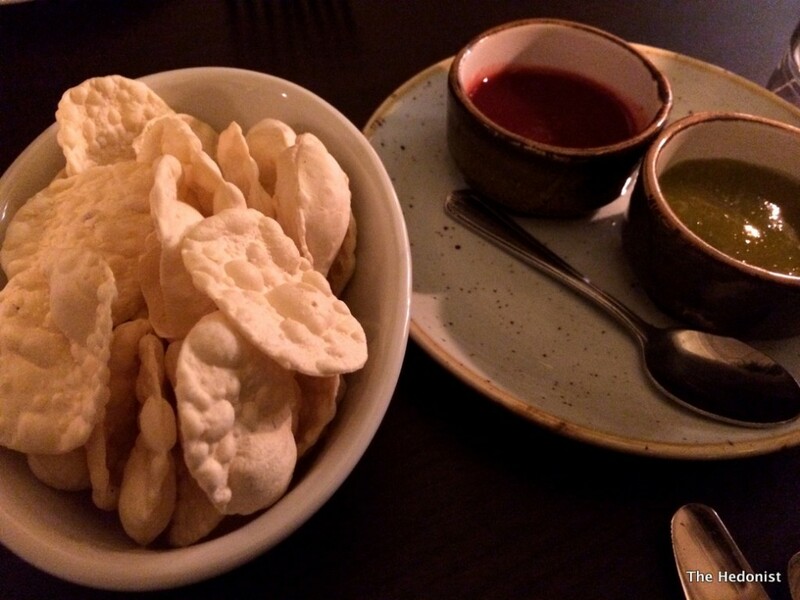 However poppadums (£3.50) were fresh and crisp served with a duo of delicious mango and nigella seed and beetroot and fennel seed chutneys. 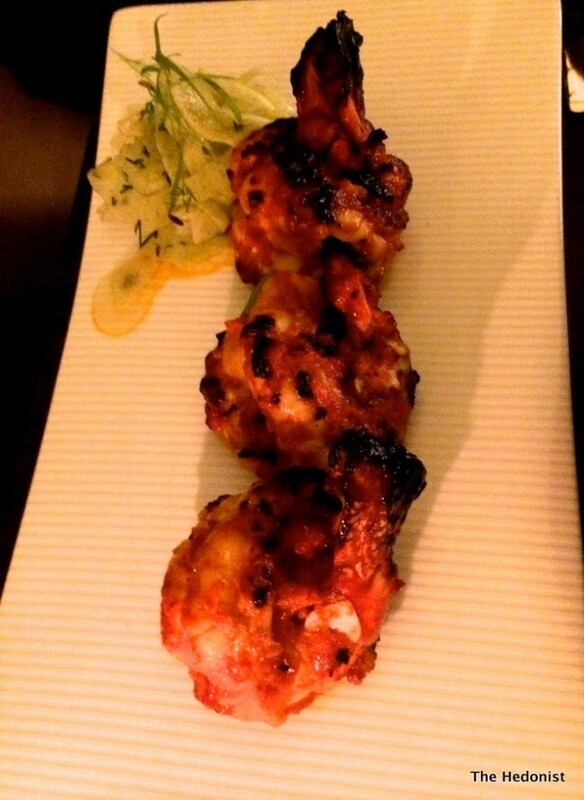 Jhinga Shimla-Mirch (£19.50) were grilled tiger prawns marinated with pureed red-pepper and spices. 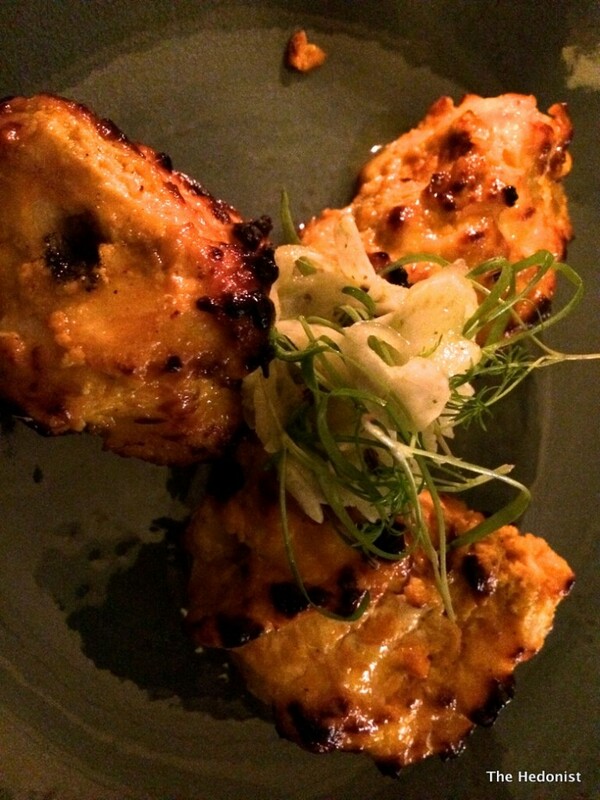 Grilled on the tandoori they were meaty and rich tasting and my glass of oaky Chardonnay stood up to the dish pretty well. 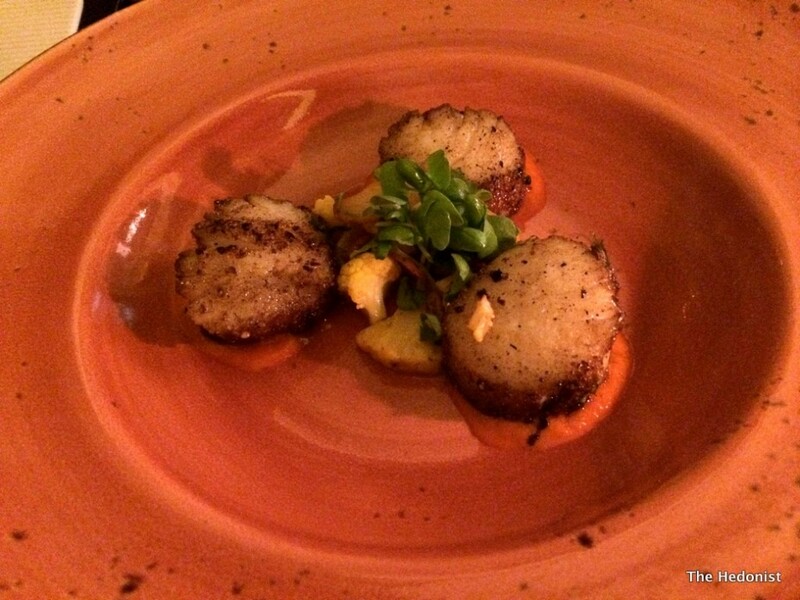 Tender chunks of monkfish (Ajwaini Macchi-£28.50) were marinated with ginger, yoghurt, ajwain and turmeric and had a deep tomato spice flavour and the recommended glass of Viognier with its apricot notes was well-matched. 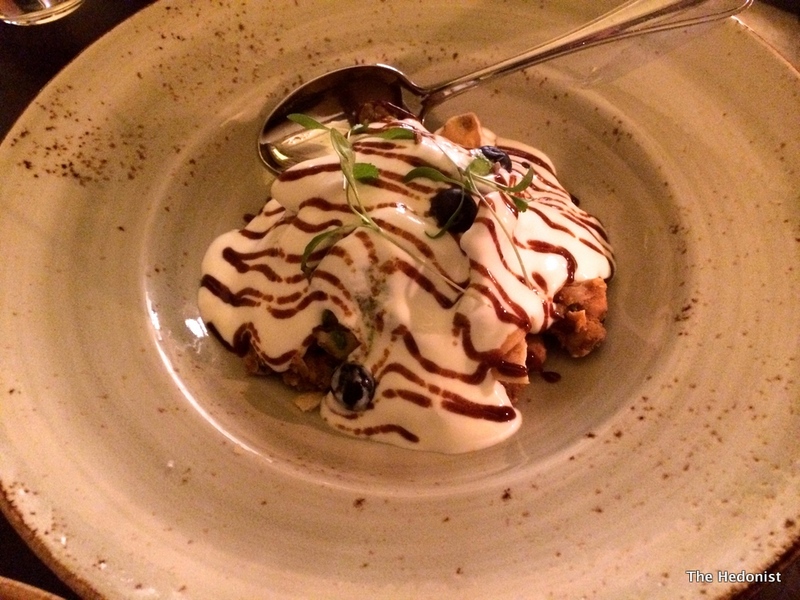 A side dish of Papdi Chaat (£6)-spiced chickpeas, wheat crisps, yoghurt, mint and tamarind chutney, blueberries-was fantastic, a perfect blend of creaminess and crunch. 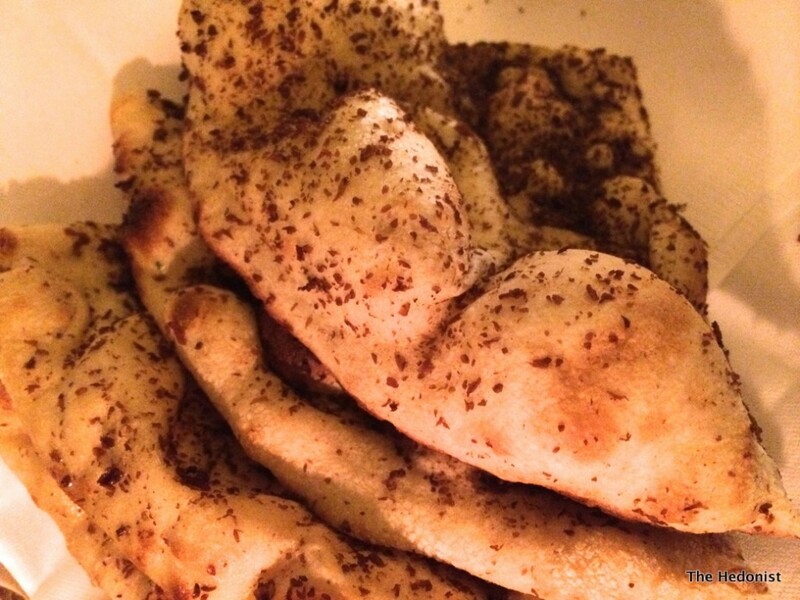 I could eat this dish every day! 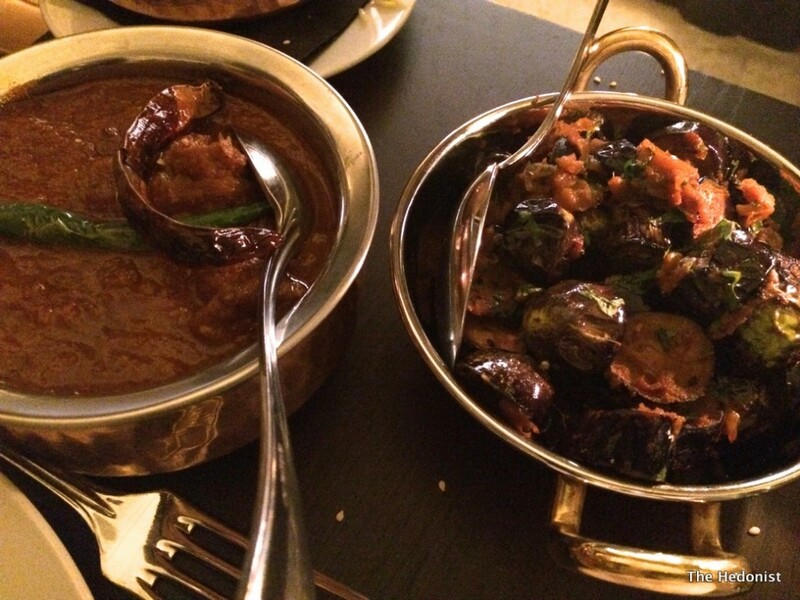 Laal Maas (£19.50), a dish of boneless lamb simmered with whole spices, yoghurt and red chilli paste, had that perfect blend of spice and heat with the meat being extra tender. The accompanying Baingan Masala (£7.50) were baby aubergine tossed with freshly ground spices that really melted in your mouth. 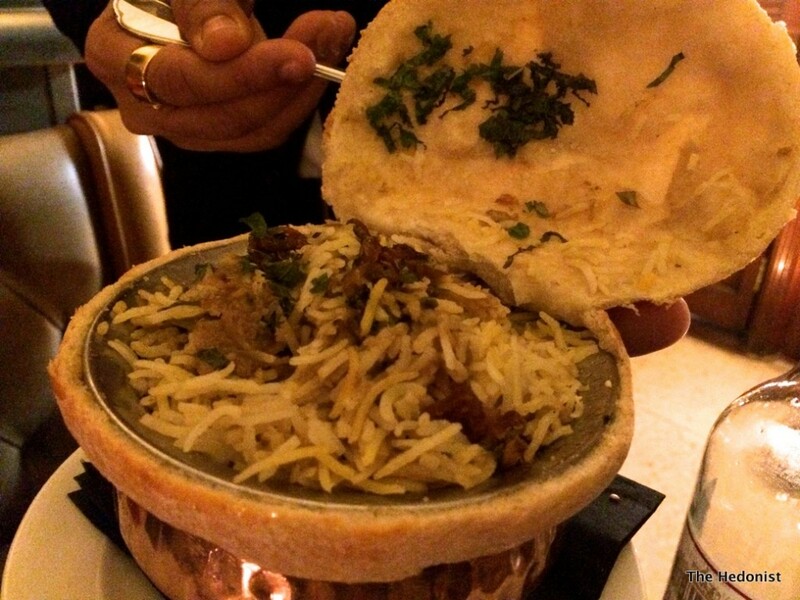 Gosht Dum Biryani (£21.50) was a delicious goat biryani served with Burani Raita that was worth ordering just for the theatre of its serving pot. Fiona drank a Malbec with both her mains that she enjoyed. 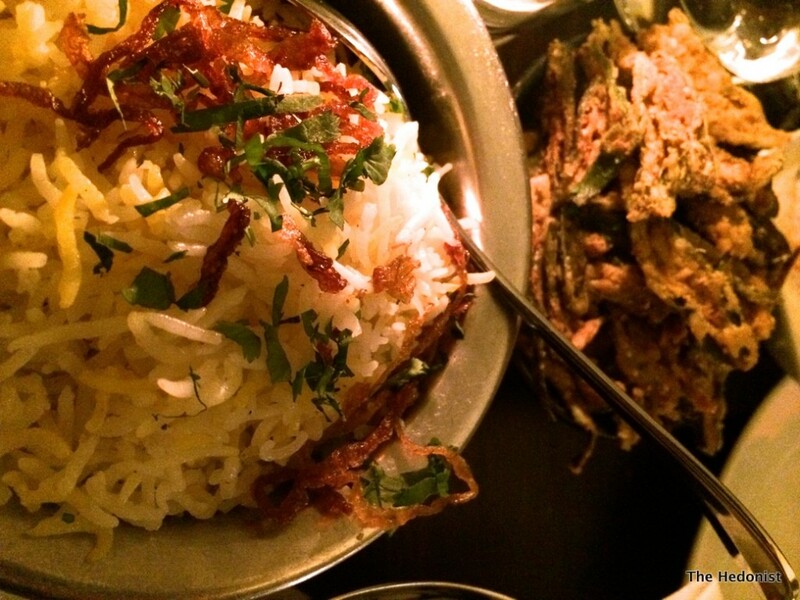 Pilau rice (£3.50) was authentic with really long grains and fragrant with cardamom spice. Bhindi Jaipuri (£7.50) was a great dish of sliced okra coated with lemon, paprika and gram flour that had been deep-fried and served as crisp nuggets of spicy pleasure. 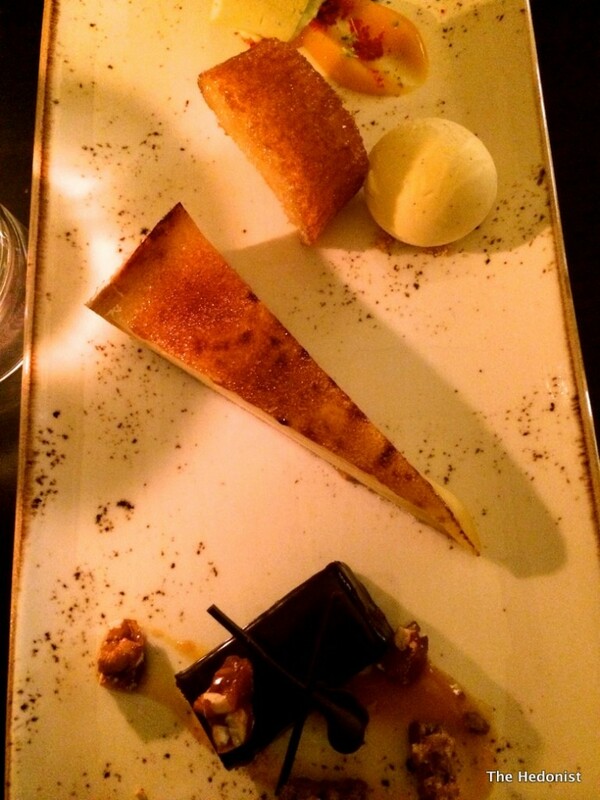 The kitchen sent out a tasting plate of desserts which were consistently good; pistachio kulfi with passion fruit purée was not too sweet and the lime tart was really light and citrussy. The rum baba was full of booze but my favourite was the ‘Bounty bar’, a delicious confection of dark chocolate and coconut with caramelised nuts. 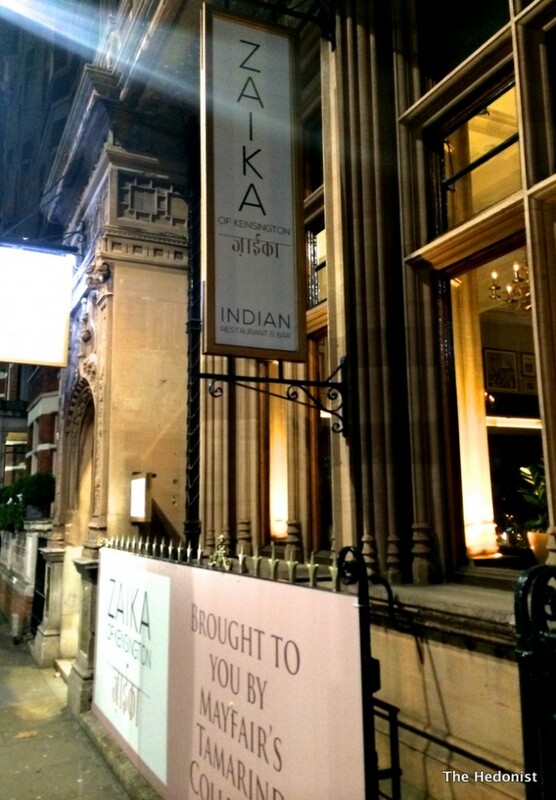 I really enjoyed my meal at the new Zaika. 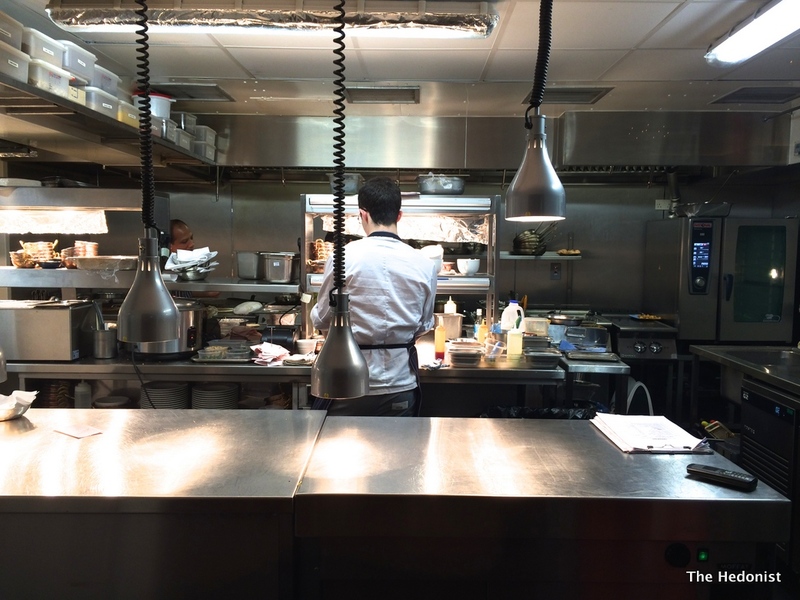 The reboot has a very different offer to the original, but if you are looking for a classic take on the food of the subcontinent in an evocative and stylish space then it’s a great option.